These Kleinpanzer Wanze tank-hunters were designed for street fighting, able to quickly move from cover to fire their rockets, before slipping back to reload. Redesigned from Sd Kfz 301 Borgward B IV demolition carriers to be tank hunters they were armed with six Panzerschreck rocket launcher tubes in a pod on a swivel mount. 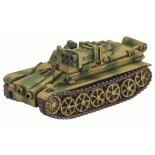 Box set includes three resin Kleinpanzer Wanze (Bedbug) models, three metal Panzerschreck rocket launcher assemblies and three metal drivers. By buying this product you can collect up to £ 0.13 with our loyalty program. Your cart will total £ 0.13 that can be converted into a voucher.